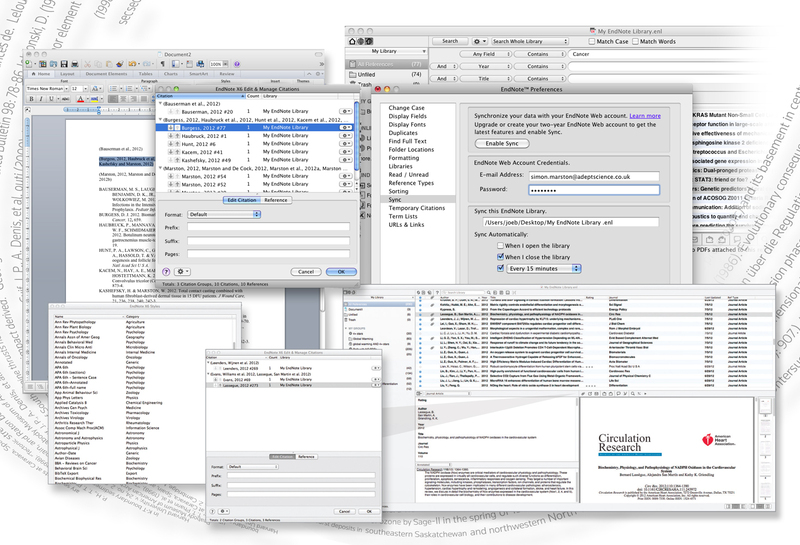 EndNote X6 on the Mac – now available! The wait is over! Now Mac users can get their hands on a copy of EndNote X6 – the latest version of Thomson Reuters’ popular powerhouse bibliographic package! Not only can they benefit from great new features like the PubMed direct export capability, ratings and read/unread status buttons for references, more screen layout options and better control of capitalisation, they’re also able to sync up their EndNote and EndNote Web library so all references and attachments can be accessed from both packages. Mac users also gain some extra functionality which will be soon be featured in the Windows X6.0.1 update. This includes font editing in the Find and Replace feature, plus a new punctuation option in the style editor. Read more detailed ‘what’s new for X6’ information online here. Along with all the new features in EndNote X6 on the desktop, users also have access to a new Bookmarklet feature via their EndNote Web account which automatically captures bibliographic information on a webpage and then creates a new references which can be saved to a new or existing group in EndNote or EndNote Web. This new tool invokes the Capture feature without the need to install a plugin or have PC admin access. The Bookmarklet is available from the installer page. Download a free EndNote X6 Mac demo now or view pricing if you’re ready to buy!